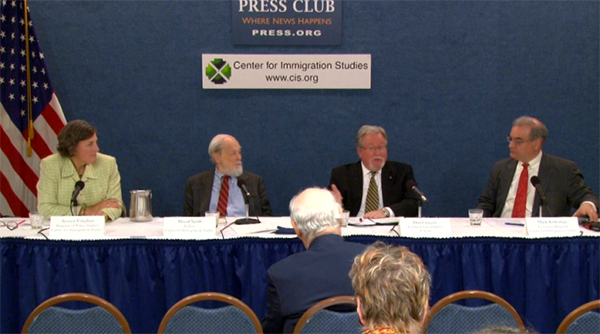 The Center for Immigration Studies held a panel discussion focusing on how to ensure that those seeking immigration benefits – whether visitor visas, asylum, refugee resettlement, green cards, or citizenship – do not pose a threat to national security or public safety. A former consular officer with the State Department, Vaughan's areas of expertise include the visa process, immigration benefits, and law enforcement. She has testified before Congress on many immigration topics, including the visa waiver program, visa security, and entry-exit controls. An internationally recognized authority on immigration policy, North has been studying the issue for nearly half a century for a variety of governmental and non-governmental agencies. He has testified frequently before Congress as well as before every federal immigration policy commission since the 1970s. Crocetti's career of administering and enforcing immigration laws has spanned more than 36 years. He served as the Interim Director of USCIS' Eastern Region, Director of USCIS (and legacy INS) Baltimore District Office, and Associate Commissioner of INS Examinations. He founded the Immigration Integrity Group, where he continues to advocate enhancing the integrity of this country's legal immigration system. And the panel today is about an issue that’s been a lot in the news, the issue of screening people who are coming to the United States. Now, the refugee issue is specifically where there’s been a lot of the discussion recently, on screening of prospective refugees, but obviously this applies not just to refugees, but people applying for any kind of what they call immigration benefits: coming here for green cards, coming here for some kind of non-immigration visa – student visas, work visas – all kinds of things. So this basic issue of how do we use the immigration system as a kind of filter to protect the country is pretty important. I mean, it’s one of the most important aspects of immigration policy. There’s other parts of it that are very important, but this filtering or screening or vetting function is pretty central to a well-run immigration system. And we have several people who are going to be talking on related issues today. Our star speaker, as it were, is Don Crocetti, who was the architect and the former chief of USCIS’s Fraud Detection and National Security Directorate – which, as you can tell from the name, is pretty important. He retired several years ago after 36 years of public service related to administering and enforcing immigration laws, and is an important voice in understanding how this sort of thing actually works. We have a video interview of him talking about some of these related issues, and he’s going to talk some more today about it. David North, a Center fellow, has written a lot about the – I call it the plumbing of the immigration system: how it actually works, not the abstract theories of it or the impacts on the economy or other things – all of which are important, but how the actual system actually works and is administered. And then Jessica Vaughan, our director of policy studies, will be our last-but-not-least presenter. And I may have to jump out at some point for a radio interview, but I’m just really here for show anyway, so you won’t be losing anything when that happens. DON CROCETTI: OK. I understand there’s various knowledge levels here and I need to be very basic. Quite a few things to talk about, so if you have questions, if you could hold them until the end I’d appreciate it. But anyway, FDNS – Fraud Detection and National Security – what’s in a name, right? Well, we picked a name that would accurately reflect what the goals and objectives and responsibilities were. To give you a little history, it’s a byproduct of the abolishment of legacy Immigration and Naturalization Service as we stood up the new Department of Homeland Security. And it’s also a result of 9/11. Obviously, immigration in a post-9/11 world is different, as well as most other things. So the reason FDNS was created is because when Congress created DHS, it broke up and separated the enforcement and services components that were in the legacy Immigration and Naturalization Service, INS, and also broke up the legacy Customs Service. They put the enforcement components together under Immigration and Customs Enforcement – ICE – and then the land border – the air, land and sea border, and the Border Patrol, into CBP, Customs and Border Patrol (sic; Protection). The remaining – the benefits side of the house – went into USCIS, Citizenship and Immigration Services. So this kind of presented a dilemma. So here we are, as validated by the 9/11 Commission years later in finding that the terrorists of 9/11 manipulated and abused the legal immigration system – i.e., committed fraud to get into the country or to stay in the country for the primary purpose of doing us harm – and then here we are in a post-9/11 world creating an agency to administer the benefits, the services, without any enforcement or intelligence components. Kind of a “duh” moment, OK? So given my experience, as mentioned, many years managing – I was an immigration officer as well earlier in my career, but managing the enforcement and benefits side of the house for many years. I was also a former associate commissioner, Senior Executive Service, policy – in charge of policy and program development in legacy INS, and a former district director in the field administering investigations, detention, deportation, and the benefits programs, OK? So, with that said, they asked me to come in because they were kind of like trading, if you would, where are the legacy INS and Customs people going to go. Well, I was recruited by CIS to come in and research the apparent void that was left in a post-9/11 world. That void, as I just mentioned: a services agency without any enforcement and intelligence. So, in doing about six months, almost a year of research, what we came up with was the need to develop an administrative component that would take the lead in detecting, deterring, preventing, and combating fraud, and separating the higher-level, major conspiracy, criminal type of fraud out and refer it to ICE, the criminal enforcement arm of the department. Because what we learned later – and I’ve got a lot to talk about, so I’m kind of condensing this – what we learned through a number of studies is that the overwhelming majority of the fraud that exists is lower-level, one- and two-party fraud, not the type of fraud an assistant U.S. attorney is likely to take for criminal prosecution. Hence, why no one opposed the creation of an administrative body like Fraud Detection and National Security. Now, the overall focus, mission if you will, of FDNS was screening, and screening to ensure that people that were granted benefits weren’t committing fraud, and to ensure that they weren’t – they didn’t pose a threat to national security and public safety. So you’ve got two primary components there: background checks, which comes under the penumbra of screening; and benefit fraud. So here we are, standing this new organization up, and we have no operation. So we have to hire people. We have to train people. We have to develop policies/procedures. We needed data right away because legacy INS didn’t leave any type of empirical data. They had never done any studies or analyses of benefit fraud, so we were starting from scratch. So we developed a Benefit Fraud Assessment Program and an Administrative Site and Verification Program. What are they? Obviously, Benefit Fraud Assessment, we focused on applications. We did about eight or nine assessments overall. We started with religious workers, because of at the time the concern about the religious – abuse of the religious worker fraud. And then we went into employment-based, non-immigrant and immigrant, temporary and permanent, marriage, asylum, et cetera. And when we – we took a statistical sampling of cases over a six-month period, and then we went out and did site visits where – which is sending FDNS officers out to the field, in the community to knock on the doors and talk to the business, talk to the religious denominations, or in a case of marriage talk to the marriage petitioner and beneficiary, or employment base, and ask specific questions that were geared towards validating the information provided on the petition. Are they truly living together in a husband-wife relationship? Are they employed in the capacity and the location as certified by the labor? Are they being paid the fee they’re supposed to be being paid? Those kind of things. What we found in the Benefit Fraud Assessment Program is overwhelming fraud, double digits in almost every area, OK? When we were doing them inside, internally, it was a tremendous help. But once they started being disclosed publicly, there was a lot of opposition, a lot of pressure. And you know, you can’t really do anything in the immigration world without either an advocate or an opponent. And then you really can’t pull data out of any immigration system – and I’ll stand by this today – that doesn’t have issues, OK? So obviously we had some methodology issues. We had some issues. We’d go to pull cases, we – statistical random sampling, using general accounting principles, working with the experts. We’d go to find the files and you can’t find 25 percent of them, so you got to pull other cases. And then there’s people, critics saying, oh, foul, that destroyed the legitimacy of your – you know, we had all those kind of issues. So I won’t say they weren’t without question. And I will admit that the FDNS, including myself standing this up, are not scientists. We’re more operational people and managers standing this up, OK? But we needed the data and we needed it quick. So we – the Benefit Fraud Assessment Program was absolutely essential to get the data that identified the volume of fraud, the type of fraud that existed, the causes, and what corrective actions and other solutions could possibly be taken. You also need that data to develop your policies and procedures, and the business rules needed to develop your systems, your technology, to include analytic software. So you cannot combat fraud without data. And in today’s world, with the available technology, you cannot do it without technology. So you need data and you need technology, and you need to do it – unlike all the years past, you need to do it smartly and intelligently, OK? The other thing you need to do is continue this Administrative Site Visit and Verification Program. Now, when I created it, we only had 100 FDNS officers the first couple years. Imagine that, with all the fraud, right? So I let a contract where we hired and trained contractors, because keep in mind that these random sampling, whether they’re Benefit Fraud Assessments or Site Visit Programs, are non-fraud-based. They’re really like a quality assurance integrity mechanism. So you could train – and this might – I might be not giving it as much credit as I should, but I used to always say I could train my – when my daughter was in high school, I used to say that I could train my daughter how to do these Administrative Site Visits, OK? So you go out and you validate the key information on the petition is what you’re doing, and you provide a report, and you send it back. Contractors make no judgments, no decisions. They’re pure information collectors. That’s all it was. Now, the agency got away from that after I left, and now they’re using their very limited number of FDNS officers, which means they’re doing less Administrative Site Visits. They’re no longer doing Benefit Fraud Assessments. So you know, you really have to question how concerned are you about fraud if you’re not doing either one of those things, OK? Now, I know there has been a movement toward resuming the assessments and a number of different analyses, and I applaud that effort. It should have been done years ago, but let’s put it behind us. We’ve got to get that done, OK? So in the benefit fraud arena, every form contains fraud. It’s just a matter of how much. Now, when we went back and did an analysis of the cases that we had performed Benefit Fraud Assessments on so that we could evaluate how our corrective actions changed that, in the religious worker area we had a 33 percent fraud rate; that reduced it to single digits when we started doing the random site visits. In fact, we built in the requirement that we had to do pre-adjudication Administrative Site Visits before the adjudicators could even adjudicate the petitions. We did that for religious workers, but the agency did not do that for the other petitions. So the way the samplings work are a percentage of approved cases – so that we don’t interfere with the process, we don’t create backlogs, we take approved cases like the H-1s, H-2B that distinguish workers, non-immigrant, whatever, and we go out and see, are they doing – are they working like they’re supposed to, OK? That has also lowered the double-digit fraud rate, that ranged from 16 to 21 percent in the H-1 area and H-2 area, down in the single digits. So it’s also a good deterrent. So that’s why I mentioned at the beginning FDNS is not just about detection, it’s about deterrence and prevention. And if you undertake the Benefit Fraud Assessments, you perform Administrative Site Visits, you put it on steroids and do a lot more, and that is going to be one heck of a deterrent, as well as get you the information you need so that you can keep a handle, your pulse on the organization to know the types of fraud that exist. Because what we also learned is as you correct or focus on one area, the fraudsters, if you will, do not disappear; they go somewhere else. It’s like squeezing the end of a balloon; the air is just dispersed. So you have to stay on top of this and you have to stay ahead of it if you can. And with today’s technology, it’s much less challenging than it used to be. But what it does do is take a commitment. It truly takes a commitment. And now I’m going to talk about the other side of the screening, the background checks. We focused initially on the fraud, but we had to quickly focus on screening because we’re in a post-9/11 world. And we implemented for the very first time in the history of immigration a biographic background-check requirement for all applicants and petitioners. So we went from zero – ground zero background checks on the overwhelming majority – there was an average of 6 to 7 million applications receipts a year; only about 1 ½ to 2 million were actually getting FBI fingerprint and name checks. So we had to stand up the capability, using technology. Had to stand that up, and had to work with the appropriate enforcement and intelligence components, and with the technology experts at the department and in our own organization. And working with Customs – CBP – Customs and Border Patrol (sic; Protection), because they owned the TECS communications system that is the basic line to various law enforcement and intelligence datasets, as well as the Terrorist Screening Database. So all of a sudden we went from zero to 33 million TECS checks a year. And why, when you only get 5 to 7 million applications? Well, foreign names, there are different variations, et cetera. And our validity was only six months long. So once we did a background check, if the case stayed pending for six months, it had to have another background check, all right? Now, years when we set this up we weren’t as automated, and there were a tremendous number of false positives. What does that mean? I give analogy of an onion: you have to peel the onion. Your first response is going to be overwhelming. You got all these hits. And you think, oh my God, all these potential national security concerns. Well, what you find out is the majority of them are just false positives, given foreign names and everything. The problem in the system is then it goes off track into human hands and you have to manually vet it with different agencies. And trying to get information out of different agencies, particularly enforcement and intelligence components, back 10 years ago was much different than it is today, OK? It was almost a fight. You almost always had to involve counsel. It was difficult to get the information because, keep in mind, CIS FDNS is a non-law enforcement agency. While we’re enforcing, not in the traditional sense of badge-and-gun-carrying agents with arrest authority, you see? The focus, if I – if I could distinguish it for you, administrative versus criminal – our objective in CIS for the administrative anti-fraud program is to validate the information, verify whether the suspicion of fraud is accurate. If not, do your report, send it over to the adjudicator to approve the case. If it is, send it to the adjudicator with a report so that they can render the appropriate adjudication. An FDNS officer does not make a recommendation. They’re fact finders. They tell it like it is. It’s up to the adjudicator. Of course, most of the time it’ll be denied either based on fraud or for other reasons that we determine, OK? But after it’s denied, unlike ICE, the administrative side places the individual in removal proceedings. They do not present the case to a U.S. attorney for prosecution. So the criminal side, ICE, when they open a criminal investigation, their objective upon proving fraud is to indict, convict, incarcerate, serve the sentence, then remove. You see, it’s a big difference, and it takes considerably more resources. And because it’s a criminal full-field investigation, there’s a lot more put into it, if you will, than an administrative side. So that’s the clear difference. Now, with the screening side of it, we built systems. Today – I mean, when I retired in late 2011, we had it almost – we had it fully electric. We had worked through with all the government agencies involved – FBI, the different intelligence components, State Department, Interpol even. We placed – what we learned was you had to place FDNS officers in those agencies with the appropriate clearances and access to the information to get over this battle because you’ll never have remote – outside access to their systems. So we did that. And once the agencies learned we weren’t a threat, and that we were able to identify the information that we needed and cut through all the other info we didn’t need, we could get it quicker and they didn’t get the pressure that they weren’t releasing the info. We had them clear the release, and then you can get the information to the adjudicators to render a decision. And this is particularly important on national security hits because we have this label called “known or suspected terrorists,” KSTs, and these are the primary group that you need to vet the cases by FDNS officers. So when I retired, we had FDNS officers in 13 different agencies, including the Terrorist Screening Center, the National Counterterrorism Center, and the overwhelming majority of FBI-led local JTTFs – Joint Terrorism Task Forces. So we were equipped to get the information we needed to review it, to determine if it pertained to the adjudicative decision, eligibility, and if it did to get the information and give it to the adjudicator. We also developed a senior-level National Security Review Board. We did not want to place the responsibility of making decisions on known or suspected terrorists on field adjudicators. So after it’s thoroughly vetted and we get the information – and most if it’s classified, and most of it is – you cannot use yet because it might be a pending ongoing investigation, and there’s all sorts of limitations as to how you can use that information. So that’s why we bring those cases in. CIS is still doing that today. They bring the cases in, FDNS takes the lead on vetting all the information and presenting it to the senior leadership, to Review Board, which includes the deputy director of the agency and senior executives of field operations, service center operations, FDNS. Then they sit there and they review the case, and they make the decision on what to do. That’s how important that is. So that’s your screening. What I also learned in the screening process is – and something I strongly recommend, and I don’t know if this is being done – but recurrent or perpetual vetting, if you will. When I was there, the counsel opinion was we didn’t really have the authority to continue to perform background checks on individuals once we grant them the benefit. That was being addressed at the time I left. If it hasn’t been addressed satisfactorily, I continue to take the position, given the cases that I’ve seen – and you read them in the public – about the number of people who immigrated as refugees or dependents of refugees, or immigrated based on a marriage of whatever – they naturalize or they got their green cards, and then later they’re added to the Terrorist Screening Database. So what we were doing – and we developed a capability to do it; it was just not flipped on – which would be to use the TECS system, the CBP system, to continue to just bounce the biographical data on all foreign nationals that were granted a benefit against just the Terrorist Screening Database, OK, for terrorists – to bounce it against that in a recurring, perpetual way, at least until five years after naturalization. And the reason why I picked the five years is because there’s a statute that actually makes naturalized citizens subject to de-naturalization if they engage in terrorist activities up to five years post-naturalization. So I know I went over my time, so I apologize for that. MR. KRIKORIAN: No problem. Thank you, Don. DAVID NORTH: OK. We have heard about the – kind of the apparatus and the things that Don did to the system about screening of aliens generally as they – as they seek immigration benefits. And I want to just deal with one set of visas, which is the F-1 visas. These are for students, foreign students, and we have about a million of them in the country. And let me just tell you about some of the problems that can happen within that particular setting. Now, let me start by saying that having aliens come to the United States to study is a great idea generally. Many of – many of them return with very happy memories of the United States. A few of them go on to be leaders of their own countries. Sometimes we hear the people coming on television who are foreign minister of that or ambassador of that and they’re talking with American accents. That probably is somebody who studied in the United States, and that’s all very well. And then I personally – I was never in that agency, but I was a foreign student. I had a Fulbright to New Zealand. Had a wonderful time, but left when I was supposed to. Not everybody does that. Many aliens in the United States are – many illegal aliens in the United States come in with F-1 visas. There are two broad classes of people who are here illegally: those that physically crossed the border – I call them kind of blue-collar types; and then the white-collar types that come in with a – except I’m wearing a blue shirt, so that doesn’t work – (laughter, chuckles) – white-collar types that come in with a – with a visa and then they overstay their time or work when they’re not supposed to. They’re called visa abusers. Within that class of visa abusers, most of them are – had arrived on tourist visas, or they came in in the Visa Waiver Program. A smaller subset, but a significant one, came in with F-1 visas as students and didn’t leave when they were supposed to, worked when they weren’t supposed to. And that’s the focus that I want to talk to you. I want to talk about how that particular visa has been abused. And there’s something like 80 different classes and sub-classes of visas, so this is – this is about the F-1s. Now, there are probably about well over a million of them. The Institute for International Education does a – kind of a census of them, gives us some data that the government doesn’t, and they found that there were 974,926 foreign students in the traditional colleges and universities that this organization, the – it’s in New York. It’s called the Institute for International Education. It’s essentially a – it’s a pro-international education think tank, shall we say. So there are about a million of them at any – at any given time, or at least in that academic year. And they don’t count everybody because the institutions that are able to cause people to come to this country to be students aren’t necessarily all colleges and universities. There are cosmetics schools. There’s the big Big Sioux Aviation school out west someplace. There are horseshoeing schools. There are a great variety of institutions, 10,000 in all, that can issue the I-20, which is a government form that is given to the universities, and then the universities decide who gets it. In Great Britain, that thing is filtered through the government. Not here. We say, OK, Horseshoe University – (laughter) – you may bring in anybody you want, issue them the I-20, this form. Then what happens is that the would-be Horseshoe student, or the would-be Harvard student, takes that to a – to one of our consulates or embassies around the world and seeks the F-1 visa, and then there is a screening at that point of – by overworked people – which I’m sure you will talk about, as Jessica had been one of them – who very briefly have an opportunity to figure out whether that person is a genuine Horseshoe or Harvard student, or not. And there’s one case out of six or seven that come to these consulates are turned down, and appropriately so. Now, that – what we’re talking about so far is the one or two, as you suggested, case situation. A student comes in – comes in, has manipulated the system so has a visa, comes to the United States, and then disappears and doesn’t go to the university, OK? But they do this one at a time, OK? There’s no – to my knowledge, there isn’t kind of a network that sort of does this. But they do it one at a time unless they are involved with something that might be called a visa mill, and there are several of these in the – in the F-1 world. And these are institutions – I won’t call them universities because they’re sort of a false-front university, and they claim to be a university. They have websites. They have a list of faculty. In most cases, they actually have some classes. But they may have thousands of students on their rolls and classes for only hundreds. There are five of these that have sort of come to our attention over the last few years, one of which is in Northern Virginia. All the rest are in Silicon Valley, around San Francisco. The one in this area was called, grandly, the University of Northern Virginia. It was in Annandale. It was in a four-story old office building in Annandale. The University of Northern Virginia had hundreds and hundreds of students it said, maybe thousands. It had four classrooms, and that’s all there were. There was not a lot of training going on, not a lot of education going on. But the people who came here to one of these institutions, these visa mills, had been through the system, had the I-20, had gotten a visa, had been admitted at a port of entry by the airport people. And many of them did not, in fact, study, but they had these papers that sort of let them in. And again, in these situations there was a pattern which I still find amazing, which is there are five of these institutions, two of which are sort of – haven’t been quite designated yet. And the University of Northern Virginia, and then out in the West Coast there was something called Tri-Valley University and another one that’s still there, still working, still burning I-20s – I don’t think it should be – called Herguan. Its president, owner, CEO and founder was sent to jail – Tri-Valley University in California – was sent to – not only sent to jail, sent to jail for 16 years. She had made millions and millions and millions from this visa mill operation. All five of these, for some reason, are managed one way or another by Chinese Americans. Three of them are for-profit, two of them are for nonprofit. And they’re largely attended by Indian “students,” or students – sometimes they’re “students,” sometimes they’re students – in an ethnic pattern which I find puzzling, but there it is. So there we have kind of a mass situation, not a one-on-one situation. And that’s something that the, unfortunately, Department of Homeland Security is not terribly interested in. I watched the University of Northern Virginia to see what would happen after it had been raided by ICE and had been suspended for a bit by Department of Homeland Security from issuing its documents, and then it was restored by DHS. And then, finally – some of you are from – some of you are from Virginia, as I am – the Virginia state higher education regulatory body, which has been asleep since Harry Byrd was governor – (laughter) – finally found that this place out here in Annandale really, really wasn’t a university. And so they, with great chagrin, actually closed it down. And then later, Department of Homeland Security, ever – you know, ever faithful, ever protective of our interests, decided that they couldn’t issue the document anymore. But that was a peculiar, peculiar transaction. And the entity which is supposed to – supposed to deal with these problems is called the Student Exchange – Student (and) Exchange Visitors Program, SEVP. And it’s a very sleepy part of ICE, which is the Immigration and Customs Enforcement, which in turn is part of DHS. But this very sleepy part of the government, SEVP, is in charge of the F-1 visas, and they have practically no field staff and they have no – very little get up and go. It’s either the U.S. attorneys or the state of Virginia that’s more energetic in the enforcement. I want to mention one more thing, and then I’ll be quiet. One of the things that happens with the F-1 visa is that not only is it abused one at a time by a whole lot of people, not only does it allow for these visa mills, there also is a – what I call a governmental abuse, and that is the creation of the OPT status. OPT stands for Optional Practical Training. It’s for graduates, foreign graduates of American universities. There’s no training involved. It’s simply a work program. And the Obama administration – the Bush administration of Bush II created this, and Obama’s expanded it. And what it does is it allows former foreign students who are now foreign alumni, if you will, to get jobs in the American economy. It’s really a – really a foreign worker program without any labor protections or anything, no screening by the Labor Department, for up to three years if they are in the STEM fields – which is up to 29 months in the STEM fields, and it will be 36 months soon I’m afraid. STEM is science, technology, engineering and math. And so these people go many, many – well over 100,000 get jobs without any kind of labor market requirements, and so they are doing this work and the employers love it. One of the reasons the employers love it is because the Bush and Obama administrations have managed to, with a wave of the hand, decide that these folks who are really alumni are still students, and under the law students don’t – aren’t covered by Social Security. So if you’re a big corporation and you want to hire somebody, some college graduates, and you’re faced with an American or green card holder or you’re faced with an alien student, you get a $10,000, $12,000 bonus for hiring the alien. That’s the way it works. And that’s – I think that’s an outrage, and that is what I would call sort of a governmental abuse of the F-1 system. MR. KRIKORIAN: Thank you, David. Jessica now will tell us in part about her lamentable experience as a visa officer, among other things screening and, you know, checking people who are applying to come to the United States. Jessica? JESSICA VAUGHAN: Thank you, and good morning. I don’t have any war stories, but I guess we could save that for the Q&A if anybody’s interested. What I’m going to talk about is what I think are the two greatest challenges and problems that create vulnerabilities in our legal immigration system, both for immigrant visas and these non-immigrant or temporary visas, that stress the systems that Don created, and enable the schemes and problems that David has described in part, and also contribute to another huge problem, which is the general visa overstay problem in the country. And this is important at this time because of the problems that we’ve seen and things that we’ve learned recently from the less-than-adequate screening that took place of the San Bernardino terrorists’ immigration benefits application, to what we learned yesterday about the fact that people who are participating in criminal trafficking organizations often are abusing our legal immigration system, to what we know about the overstay problem, is that our processing and screening are not adequate now. And as a result, we understand that the House Judiciary Committee is considering legislation to implement some of the needed changes that have to be adopted in order to confront the very severe threat that we face now – so to be able to better prevent illegal immigration as well, which in itself is not only a security risk but a physical and economic problem. So one of the two biggest problems for the agencies that process visas and immigration benefits is the sheer volume of applications that they are faced with processing. The workload is absolutely mind-boggling at these agencies. And in your packets I included a couple of charts that illustrate the growth in the workload that has taken place under the Obama administration just as a point of reference for time; that, in – the Obama administration has presided over and also deliberately contributed to a significant increase in the volume of visas that have been issued. If the Schumer-Rubio Gang of Eight bill had been adopted – and many people are still pushing for those very same changes to the law – this workload would have been at least doubled as well. It’s enormous now. If the Schumer-Rubio bill had been adopted, it would be greater still. In 2014, the embassies and consulates of the State Department processed nearly 470,000 immigrant visas, which are these, each year, or that year, and more than 11 million temporary visas. This was an increase of more than one-third just since 2008. The immigrant visa workload has remained flat, as you can see by the bars, even though immigration has been gradually increasing. And that’s because more and more of the green cards that are being granted are being granted right here in the United States to people who are already living here. All of the increase in the State Department’s workload has been in the processing of non-immigrant visas, and this has happened even though the Visa Waiver Program has been growing significantly as well, with more countries being added to it. So, you know, one of the big arguments for the Visa Waiver Program, which allows travelers to enter without having applied for a visa and being screened by the consular department, is that it reduces the workload for the State Department. But somehow the State Department is issuing more and more visas, even though more and more people are also entering through the Visa Waiver Program. And you can see the impact in the border crossing volume stats, which is the lower table there. Visa Waiver Program entries have gone up by about 5 million a year since 2008, and air and sea entries have also gone up significantly; as have border crossing card issuances, which are basically temporary visas that are issued to Mexican citizens that are supposed to be for people to stay within the border area to visit family and friends or to do shopping or conduct business. Those have gone up enormously under the Obama administration. As Don said, the USCIS workload annually is 6 ½ to 7 million applications each year. And again, all of this would have been exacerbated had the Gang of Eight bill been adopted, but it’s been going up even without that due to policies of the Obama administration. Now, I don’t know the most current consular staffing levels, but in 2012 there were about 1,700 consular officers stationed overseas to process these less than half a million immigrant visas and more than 11 million non-immigrant visas. So if all of them were working on NIVs, which they aren’t – a lot of them are working on immigrant visas and American citizen services – but if all of them were working on the 11 million non-immigrant visas, that’s about 6,600 non-immigrant visas issued by every consular officer overseas in a year. Now, the staffing levels of the consular sections have increased pretty significantly since 2002, from about 1,100 in that year to about 1,700 today. So that’s about 35 percent, and that’s about how much the NIV workload has grown as well. But when you consider that after 9/11 it was – even before 9/11, but especially after 9/11, when we understood that the worst-case scenario of making a mistake in issuing someone a visa could be that they would be a terrorist who would attack and kill thousands of Americans, everyone acknowledged that the State Department did not have enough people to adequately process these applications. But even today, in 2015, now we see that pretty much the staffing has grown proportionately to the workload, which means essentially we’re in the same position now as we were around 9/11, with inadequate staffing in our consulates overseas to manage the crushing workload that they’re trying to deal with. Now, to be fair, there have been some very significant technological advancements, but the staffing levels have not changed. And that’s why it was easy for me to see, but surprised a lot of people, how little attention was given, for example, to the visa application for Tashfeen Malik, the – one of the San Bernardino bombers, who came here on a K-1 fiancée visa. You know, and judging by the documents that have been released since that attack, we can see that very little time and attention was given to her application, despite where she was – the part of the world that she was coming from, the fact that she was being given permission to live in the United States permanently and become a citizen, beyond the path to citizenship. Very little time was spent processing that application, and we know that for one thing she made misstatements on her application. No one ever checked to try to verify any of her claims. And there are also some indications that, you know, perhaps the consular officer didn’t really ascertain that she and her fiancée were even in Saudi Arabia at the same time to become engaged. But clearly we simply do not have the human resources needed to adequately vet the applications that people are coming, and this is, again, another kind of worst-case scenario example. The other major problem that has not changed significantly since 9/11 that I think is as big a challenge as the crushing volume of applications that officers need to adjudicate is the emphasis by the agency leadership, at the State Department but also at USCIS, on the – facilitating the travel of people to the United States and servicing the people who are applying for these benefits, and processing these applications as quickly as possible. So the emphasis still really is on the quantity of applications rather than the quality of the adjudication. Now more than ever, it’s apparent that applicants need meet no more than the paper criteria for the visa or benefit. In other words, there’s little to no scrutiny that takes place or assessment of the credibility of the applicant. And that’s the kind of assessment that can only be done with human interaction. In other words, it’s easy to run people through databases to see if they show up on – you know, on the list of known terrorists or as someone who has a criminal record. What’s – what you can’t check a database for is, does the applicant seem credible? Like, you know, is a person who’s more qualified to study horseshoeing trying to get into a selective institution like Harvard University or some other school? You know, does their story make sense? Are they credible? Does this look like an appropriate relationship? There are all kinds of questions that a trained consular officer can ask that might – that, if thoroughly investigated, would lead to the proper denial of more applications and possibly could have prevented the approval of someone like Tashfeen Malik and other terrorists who have managed to infiltrate our system. I mean, we know now from documents that have been released by the Senate Judiciary Committee that more than a hundred people associated with radical Islamic terrorist groups have been able to come in through our legal immigration system or are the children of people who have come in through our legal immigration system. So clearly mistakes are being made. And the other evidence that mistakes are being made on a very grand scale is the number of overstays that we find in the country. And this is a problem of leadership, not a question of technology. The law does not require that all applicants be approved if they meet the paper requirements for the visa. For example, if a student says I’ve been accepted at X institution, that shouldn’t be enough to just issue the visa. On the contrary, there are many grounds for denying visas that are rarely invoked nowadays, whether it’s someone’s suitability for an academic program, whether it’s an accredited academic program, whether the person has ties to terrorism that might be detected, or even has the ability to be economically self-sufficient. So the results of this failure to uphold any standards means, of course, that we’re failing to detect terrorists, people who are being trafficked, people who commit fraud, and ordinary overstays. The number of visa overstays is a large share of the illegal alien population. The generally accepted estimate for the size of the population is about 4 ½ to 5 million people in the United States today who entered with a visa and overstayed. That’s about 40 percent of the illegal population. For years now, DHS has been collecting biographic arrival and departure data for visitors who come in by air and sea. This information would be a hugely valuable tool for the State Department to use to evaluate, to understand if they are making the right decisions in general for visas, to understand who’s not leaving when their visa or, you know, their authorized duration of stay expires. What countries are the overstays coming? What categories are bringing us a lot of overstays? But the Department of Homeland Security has yet to disclose anything that it has found from analyzing these arrival and departure records. One of the very constructive provisions that was in the omnibus budget bill that just passed Congress and that the president signed about a month ago was a provision to actually – you know, Congress has been demanding this data for many years. DHS has never given it to them, even though they have it. Now, because of a provision in the budget bill that just passed, Congress threatened to withhold certain funding for DHS until they submitted this long-awaited overstay report to Congress. And the due date for that report is actually a week from today. So if DHS does submit this report to Congress, we may soon have the opportunity to know what the State Department has been dying to know, and other analysts have been dying to know, is who’s overstaying from what country and what categories of visas – critical information. From what I’ve seen of official data and academic reports on this subject, we can expect that this overstay report, if DHS releases it, will confirm that overstays are definitely contributing to the illegal immigrant population in a significant way, probably about 250(,000) to 300,000 new illegal arrivals a year on overstays. The report should also confirm that the Visa Waver Program is contributing more than its share of visa overstays, and that certain countries including a few that are associated with national security concerns have alarmingly high overstay rates. So what should be done? There are improvements that need to be made both in the tools that adjudicators have to evaluate these applications, but also equally important the policies that exist that they follow when they do their jobs. Clearly, we need to improve the staffing ratios of officers both at the State Department and USCIS, so officers have more time to review cases. We need to finish the entry-exit tracking program so that we have more complete data on both entry and exit that our agencies can use to find out where the problems are. The Benefit Fraud Assessments that Don described are a hugely helpful tool to use, and there needs to be a comparable program, Visa Fraud Assessments, at the State Department. This is a proven way to deter and detect fraud. And it needs to be done by both USCIS and State. But obviously we need to adjust certain policies as well to make it – make improvements possible. There is now too much staff time that is spent on the wrong kinds of applications. So the first thing that needs – that I would recommend in terms of specifics, and I’ve got four that I want to quickly go through that I hope will be – that the judiciary committees will look at when they’re crafting legislation to respond to the visa screening problem. The first one is that to address this problem – too many staff working on the wrong applications – is to just simply stop accepting petitions if a visa category – a green card or immigrant visa category is not current. Right now, we have a huge waiting list of about 4 million people waiting for their immigrant visas or green cards. Some of those waits are five to 10 years long. There’s no reason to actually accept and spend time processing those petitions to sponsor immigrants. It’s a waste of the staff time at USCIS. State Department used to do this work. They don’t anymore. In my opinion, this is a complete waste of time and we shouldn’t spend any time on it at all. Simply say that we are – our government is not going to accept applications to sponsor an immigrant until there’s a visa available within the next couple years. And that would free up an enormous amount of staffing – staff to process other types of applications that are more likely to be issued in the near future. It also removes a big incentive that people have to just file the petition to bring in an immigrant, knowing that it’s not going to happen for a few years out, and relieves the pressure that the – that some advocacy groups have to simply issue people a work permit even though they’re not likely to get a green card anytime in the near future. But the main thing is to reduce this workload. Secondly, the San Bernardino terrorist case and also that OIG report that came out yesterday on human trafficking organizations using our legal immigration programs demonstrates the imperative to vet the sponsors as well as the applicants, that you should not – we should be taking a look at who is sponsoring people for immigration benefits. I believe that if USCIS had vetted Syed Farooq, Tashfeen Malik’s husband, as thoroughly as they would have vetted an alien, they might have been able to learn of derogatory information of concern that might have flagged that application for further investigation. This has to – and it’s clear from the OIG report on the human traffickers that if there were more vetting of the sponsors, some of those human traffickers would have been detected. Right now, there’s a lot of stove piping of information. The Obama administration has adopted very strict confidentiality policies that apply to immigration benefits applications, that the Gang of Eight would have codified into law, that prevent the benefits granting agency from sharing information with the enforcement agencies. And that’s what caused the problem with these human trafficking cases, was that there was not proper information sharing. USCIS knows a lot about people who are applying – who are trying to bring in people. It should be of interest to immigration enforcement if smuggling organizations, traffickers, or people with ties to terror groups are trying to bring in people for green cards or any kind of immigration benefit. This has to include fingerprinting. And I did a blog for our website that shows the difference between fingerprint-based checks and biographic name checks, and the kind of checks that are currently done on sponsors. But you simply shouldn’t be able to sponsor someone for a visa or green card if you have a criminal record that’s serious, if you have involvement in any immigration fraud or crime, and if you’re not financially self-sufficient, in other words, you know, if you’re using welfare programs or are dependent on affidavits of support from third parties to show that you can actually support the people that you’re asking to bring in as immigrants – if you can’t show financial self-sufficiency, you should not be allowed to sponsor someone for a visa. Clearly, there need to be more interviewed mandated as well, especially for marriage cases. I think the petitioners and the applicants need to be interviewed together in their home country. I think that would assist the screening. DHS needs to pay more attention to who it’s allowing to accept foreign students, to address the student visa fraud that David talked about. And finally, what I would like to see are mandatory triggers for enhanced screening of visa applications based on empirical studies, like the Benefit Fraud Assessments that Don described, and the Visa Fraud Assessments that should be taking place, and also the overstay rates and the refusal rates, so that we know, again, which applicants are the problem. It’s not enough to say, oh my gosh, we’re letting in too many people. Let’s just reduce it across the board by 10 percent. That’s not going to really get at the fraud and security problems. What we need to do is study where the fraud exists, where the problem applications are, and actually not just do the studies but require the government agencies that are processing the applications to implement enhanced screening measures for certain countries and certain types of applications so that a visa officer in Islamabad is not spending 20 minutes on a fiancée visa application and doesn’t have time to check out the statements that are made on that visa application, that they have time to maybe look at the social media posts, if appropriate, or other – check other parts of that application that can be verified, even with the help of local staff. It's not enough to do – to study the problem. Corrective measures need to be implemented. And this has been proven, as Don described, that the fraud rates in certain categories, when enhanced screening is applied to the process, can be reduced dramatically from doubt digit to single digit fraud rates. Obviously that also has to be supported by enforcement from our enforcement agencies. And that’s not happening. But mainly what we need is – we know that we have the tools. What we’re lacking is not only the policies to use them properly, but also the leadership to make sure that they are actually implemented to the best effect. So now I think what we’d like to do is open it up to questions from folks? MR. KRIKORIAN: Sure. Anybody have any questions? Yes, in the back. If you could identify yourself too, please. MR. KRIKORIAN: I’d rather a question, actually. Q: Well, yes. My name is Judy Carson. I’m a retired consular officer from State Department and worked in the consular fraud visa passport fraud division as well. I don’t know who you all in the audience are, but I want to thank CIS for actually bringing this very serious problem up, because there are lot of vulnerabilities in the immigration system. And there’s so many vulnerabilities that what happens is even the talk of amnesty fuels more illicit facilitation efforts, not just smuggling and trafficking but, of course, the possibility for terrorism. It’s a broken system. And a lot needs to be done. So I encourage people to talk with you all as well as us retired consular and DHS officers because we are the ones that Congress should be asking to staff a working taskforce to provide them options on how to fix the system, because there are ways to fix the system. But it’s scary. A lot of my colleagues are very, very upset for years over what’s been allowed to happen as our immigration system just falls apart completely. And why is this important? It’s important because us U.S. taxpayers – our hardworking, struggling U.S. taxpayers, are subsidizing foreigners who scam the system. Birthright citizenship is a big scam. Look at our hospitals. Look at how they’re going bankrupt because any foreigner who wants to come to this country any way they can, on a visa or illegally, can have a baby in this country on the taxpayer dime and then ask for a waiver on humanitarian reasons to stay. I mean, it’s crazy. It’s a scam. Look at the numbers of people in schools who are from other countries now. I mean, my guess is that the illegal population, and I include overstays on that and include people who are legally working in the United States not paying taxes, is probably over 25 million. And we are also subsidizing very wealthy foreigners who come and launder their money buying million dollar condos in Miami. And they’re not paying their fair share of taxes. We’re subsidizing them. It’s nuts. So anyway, please keep doing your work. If you want to know about the visa system, please ask me or these folks. I’ll be happy to explain it. And one more thing, Congress should be representing the people who they were elected to represent, which are U.S. citizens. They need to demand more information from State and DHS on the number of illegals and what’s going on. And we need to do something about it. MR. KRIKORIAN: Thank you. Any other questions? Yes, Don? Well, here, wait for the mic. Q: OK. I am – thank you. I’m co-chairman of FAIR’s National Advisory Board. And I’ve listened to this wonderful panel, and of course just the wonderful comments made from the back of the room, which certainly underline my concern. My question was going to be to Jessica Vaughan, who’s done such brilliant work with her writings, is how many illegals are here? And I think we’ve already had an estimate. It certainly isn’t 11 million. And what you’re saying, Jessica, we’re talking about 250,000 every year that get added to that. And maybe that’s a modest number, I don’t know. That’s my question. MR. KRIKORIAN: Well, if I could – I’ll take that one. We’ve actually looked at this a lot. I mean, this is – it may not be 11. It may be 12. It may be 13. It can’t be more than that. It literally cannot be, because we know all the – we know how many people are born here. We’re able to match the estimates that they have of the illegal population with the administrative data from the schools, from death records, from birth records. So we could be off. I mean, our estimates of a million – 11 or 12 million could be a million off either way. It’s possible. Q: But you don’t think that 25 is close? MR. KRIKORIAN: Yeah, it’s literally impossible. It cannot – it just can’t be. Q: (Off mic) – and people born in the States? MR. KRIKORIAN: No, no, no. This is just people who are illegal immigrants, not the children of – and it’s – yeah. Q: That little lady that was testifying the other day was like a deer in the headlights when they got asked the question, you know, well, how many overstays are there. Well, I don’t know. I’ll check. MS. VAUGHAN: Yeah, yeah. The thing is DHS does know, it just hasn’t disclosed it to Congress or the public. MR. KRIKORIAN: Well, even they don’t know that well. I mean, even – yeah. MR. KRIKORIAN: They know better than they’re telling us, yeah. MS. VAUGHAN: Right. And they’d know even better if they would implement the biometric entry-exit tracking. MS. VAUGHAN: But there’s a – they know more than they’re saying. And it’s important that this information be available to officers so that we have some empirical basis for making the decisions that are – that they have to make every year. MR. NORTH: OK, one more comment, and this is honest, is the fact that neither party wants to fix the system. And I’m done writing on this. The externality party, the parties that ruin the coal fields down in West Virginia and pass that along to the taxpayer, that’s what an externality is. But these parties – both parties want to keep the system going. And basically, that’s what they’re doing. And basically, if we don’t fix it, it’ll just keep going to the same way. Sorry to say that. Q: I don’t think – I think you’re right, Don, absolutely. MR. KRIKORIAN: I had a question specifically about the screening issue, probably mainly for you, Don, although maybe Jessica has something to say about it. And this is specifically about the screening, as opposed to the fraud detection part. The screening is only going to be as good as the data entered into the tools that you use to screen people. I mean, a screen doesn’t do – if you think of an actual screen, it doesn’t good any good if the holes are this big, the flies will fly through them. Well, in the metaphorical screen like this, if we have no idea what we’re screening for then there’s a limit to how effective it is, isn’t it? I mean, in a sense, isn’t screening, as we’re doing it now, sort of like the drunk looking for his keys under the streetlight because that’s where the light is best? (Laughter.) Anyway, I mean, I’m not attacking the idea, I’m just saying aren’t there limits to it. Q: OK, the bar is right here. MR. CROCETTI: Oh, I’m sorry. USCIS I believe has the most – has improved the screening process a thousand-fold pre-9/11. They have a very sound background check process. And it’s improved since I left. I know that for a fact. It is true that the refugee screening is even – it’s the best. It’s superior – it’s even more enhanced than the non-refugee applicants, primarily because you’re talking about a different population of individuals, and more specifically people who are outside the country, so you don’t have Privacy Act and other limitations and issues. Also, the systems – whether you call a suite of other government agencies systems or whatever – it is much more enhanced from an intelligence law enforcement vetting data set, if you will. So it is good. Now, I also give credit to USCIS Refugees and Affairs Division, because I understand they’ve also inserted a new review process at headquarters before they allow cases to be interviewed. So they’re now being reviewed and vetted internally before a case is even interviewed. So I think that’s great. But where it breaks is you have the senior official of this country’s law enforcement agency, the FBI, and the senior law enforcement official of the entire intelligence community saying: I have a concern. And I have a concern that we don’t have access to the Syrian databases and datasets that we have had and normally have for refugee processing because of the current state of affairs in Syria and in the Mideast in general. So we have a concern that you’re going to be admitting refugees that we really can’t vet from an intelligence perspective. I would say – of course, I’m biased. I was the architect and the first director of Fraud Detection and National Security. If I were the president, I would listen to those individuals because to me it’s about risk management. And while you can talk about risk management with benefit fraud, at least the risk if you’re wrong is they get the benefit – the overwhelming majority are not threats to national security and public safety, OK? But in this scenario, where you have the ISIL threat, you have the promised infiltration of the refugee process, you have increasing number of terrorists being identified that had abused the refugee process. And if you’re wrong, the consequence is hundreds if not thousands of lives. To me, I’d be a little concerned about that lack of ability to vet, because a good analogy is you’re going to have a certain percentage of fraud get by. So as we’ve learned in the Benefit Fraud Assessment, it’s just a rough number. If you assume there’s a 20 percent fraud rate – that 80 percent of the people are entitled to the benefit and get it. So if you have 20 percent or even 10 that aren’t, and they – and that’s the fraud you catch if you do the assessments and the site visits, there’s also the fraud you don’t catch, OK? So it’s actually much higher. So our fraud assessments were always very low-side, minimum fraud levels, OK? When you get into the national security arena and you look at that, there is no doubt in my mind that the individuals you’re dealing with are better trained and better prepared for an interview to infiltrate this country than the regular fraudsters, if you will. So if 20 percent or so get by the regular interviews, you’re going to have at least a similar amount, if not larger, of trained terrorists get by the interview process. That’s what concerns me, OK? Now, I’m retired. I can profile. I can use risk management. I don’t have to be politically correct, OK? But I administered benefits programs for years. I was an associate commissioner in charge of benefits program. I’m all about immigration in a legal, controlled manner, OK? But here’s one that I have to really caution what’s being done today with the refugees. I’m not saying don’t let Muslims in this country. For God’s sake, I’m not – I don’t believe that. I think it’s wrong. But I think there’s a percentage of refugees, lower risk. We should risk-manage the refugee program, OK, to minimize the risk, because we’re talking about human lives. MR. KRIKORIAN: Thank you, Don. MS. VAUGHAN: Can I just say one thing? MR. KRIKORIAN: Sure, please. Yeah. MS. VAUGHAN: To go back to your analogy about the drunk looking for his keys under the light because that’s where the light is, that I think is a perfect analogy. What the Benefit Fraud Assessment and Visa Fraud Assessments and overstay reports and other empirical data, what we learn from studying the problem tells us drunks where the keys are. But we still need human officers in adequate numbers to have eyes to be able to deal with these applications. It’s not enough to just do automated checks against lists of known terrorists and databases and so on. We have to have human interaction in order to effectively evaluate or investigate any of these applications. And that’s why the staffing levels are so important as well. We can’t let – technology is not the only answer to this problem. There has to be a human element too. MR. CROCETTI: And I think we may even may disagree to a certain degree here, because I think in today’s world, where the numbers are much larger, the threat is much bigger, we really need to get away from the same old way of doing things, OK? The traditional law enforcement methods of arresting and detaining and placing in removal proceedings, ordering them deported, they never leave, I mean, we need to get away from that. We need to think more smartly. And I think technology is the primary platform to do this, OK? We need to make – we need to have laws and policies and operations that encourage compliance with the law, that hold people accountable for not violating the law. And I don’t mean hold them accountable for, you know, physical reasons – arresting, detaining and removing. I don’t mean that way. But if you break the law you cannot obtain any benefit while you are in this country. No waivers. No exceptions. We’ve gone to extremes to come up with waivers and exceptions to get around visa numbers, to get around ineligibilities. I mean, we’ve got to wake up as a government and what we’re trying to do if we want to control immigration. And this goes back to my point, have we ever not done – immigration, as we all know, is very politicized. And it varies from administration to administration and party to party, and do they really have a stomach to control immigration? I’ll even go a little further. Do they really have a clue what it would take to really reform the immigration laws? And I’ll tell you right now, no. The number of congressmen and senators that truly understand the totality you could count on maybe both hands, OK? And when you talk to them, they just have their area, their issue, their selfishness. That’s what it is. But if you really wanted to fix this, technology’s a key platform. And the laws, you make – encourage compliance, you penalize for not complying, you have to be outside the country to apply for a benefit if you violated your status, you got to pay a fine before you do it. And you watch how many people stop coming, how many start complying with the law, and how many start leaving. OK, you need a system that does that. And here’s where I go with technology. I think because, say, 80 percent of the people are law abiding, or at least – I mean, there are law-abiding people now that kind of slide a little bit more on the non-law abiding side because our current systems and process encourages illegal immigration. It doesn’t hold anybody accountable, OK? So it’s natural for people to just not fear overstaying their visit. That’s why it probably exceeds 40 percent, the overstay rate, all right? But if we use technology, we realize that percentage, you don’t need to interview. Go back to risk management. Take the trusted traveler program, CBP has a number of trusted traveler programs. Once you have your biometrics collected, you’re vetted, you’re determined to be admissible, you can enter the country, the system supposedly – the theory here is the arrival-departure database – the overstay database manages your coming in and departing. Hey, and as long as you come and go, you’re not arrested, you don’t overstay your visit, you leave when you’re supposed to, you can continue to come and go. Don’t even need a visa, exception we go into the Visa Waiver Program that Congress thinks it’s fixing, OK.
Well, you go into the Visa Waiver Program. There are certain countries considered hostile to the United States. There are certain known countries for years – even since I was an associate commission when I was responsible for air, sea, and land border ports of entry, you have overstay rates that exceed the percentage that the country should have been penalized and not allowed to continue to issue visas. You need laws that you enforce, OK, but if you use technology and you effectively monitor people, and you hold them accountable – you don’t have to lock them up, you don’t have to order them or detain them or remove them, just make it difficult to stay here. It goes back to your students. If you drop out of school, the system’s going to track it, the school’s not going to be authorized to readmit you. You got to leave the country. You got to start all over again. You can’t work if you – you know. And then, of course, the bigger system, you need a national mandate for E-Verify and you need to collect the biometrics on everyone – foreign nationals in the country. So I think this can be done. And I don’t think everybody needs to be interviewed. But I will agree with you wholeheartedly that when you risk manage and you identify the population that is a risk, then there’s nothing better than in-person contact – nothing better. And I can tell you as a former immigration inspector, adjudicator, et cetera, that I can sit someone in front of me and interview them for a benefit and within minutes tell you if there’s fraud. In fact, a lot of time just from walking the individuals from the waiting room to my officer for the interview I pretty much have a hunch, OK? You train people. There’s nothing better than in-person interviews. And as far as the State Department is concerned, we work very closely with their fraud prevention program, the consular officers in specific countries, they’re the most knowledgeable of that environment and that culture and that area. That’s absolutely essential. Now, when it comes to marriage cases, including fiancée, I looked at that case with the San – and I’ll be honest with you, I’m not really sure – I think it was some sloppy work, but I’m not sure even the background check process today would have flagged that case unless social media was authorized, which is something I tried to push through, but it hasn’t been authorized yet for adjudicators and FDNS officers. But I do believe that limited interviews, high risk, but on all marriage and fiancée cases, because of the fraud rates, OK? That becomes a high-risk area. You definitely want to interview – you have a policy that mandates the interview and controls the exception, as oppose to the reverse, which is what’s going on now. MR. KRIKORIAN: Thank you, Don. One last quick question, because we need to respect people’s time. Q: Yeah, I just wanted to return real briefly, Don, to your comments on refugees. It kind of sounds like – I don’t want to put words in your mouth – but it kind of sounds like you might be advocating a pause in bringing in refugees. MR. CROCETTI: For refugees. The thinking, the mindset, the processes were different. So if I had the authority, I’d say: FBI, DNI, CIA, Department – DOD, whatever, get together, define what a national security check is, what are the all the databases, what are the all the datasets that need to be checked, and who are the signoffs? And I would incorporate in there that any information pertaining to a national security threat has to be further evaluated and issued a level or some sort of clearance by that particular intelligence or law enforcement agency. Because CIS is not the expert in that regard. CIS has a great screening process, but it’s only as good as the data and the custodians of that data. So you need the intelligence and the enforcement world doing that. That’s what I would build into the Syrian and other processes for security.